Oregon is bordered by Washington to the north, Idaho to the east, and both Nevada and California to the south. It’s entire western flank is on the Pacific Ocean, which can make Oregon car transport difficult. The western third of the state, hugging the Pacific, gets plenty of rain and hosts incredible waterfalls and forests with tall Redwood trees. The eastern expanse sports a high desert plain with low population centers. Oregon is the 9th largest geographic state, which means a vehicle transporter needs to cover a lot of ground to get to the people. Of the ten most populated Oregon cities, eight are in the Willamette Valley in the western side of the state. Native Americans inhabited Oregon 15,000 years ago. 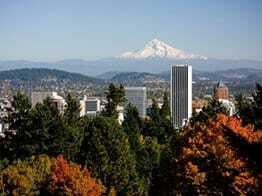 Spanish explorers “discovered” Oregon in the 16th Century, and French Canadiens settled in the 18th Century. President Thomas Jefferson sent Lewis and Clark to explore the region and America stole it fair and square shortly after. Nobody is really sure where the name Oregon is derived, Indians or a misspelling? Regardless, it was admitted into the Union in 1859 just in time for the Civil War. Welcome to America, Oregon! Ship A Car In Oregon? There’s really only one really reliable place for both the east-west US routes and the north-south routes. Think of Oregon as a rook on a chess board. You can only move horizontally or vertically, but not diagonally. That is not literally true, of course, but it sure seems that way. Interstate 5 runs the length of the state from Washington to California, which connects Portland, Hillsboro, Gresham, Beaverton, McMinnville, Salem, Albany, Corvallis, Eugene, Springfield, Medford, Ashland and Grants Pass to big metropolitan cities such as Seattle and Tacoma to the north, and San Diego, Los Angeles and the San Francisco Bay Area to the south. Safe to say that it’s a relative breeze running up and down I-5. Gotta love it for Oregon car transport! Let’s not get too carried away, however. Look at the map. How many major interstates do you see intersecting I-5 along a east-west route? You get the picture … and the problem. Only I-84 does that and for greater Portland. Ouch. That makes it hard on our Oregon car transport calculator trying to ship anywhere east in the United States from anywhere south of Portland. Let us suppose somebody has a Chevy Camaro in Eugene, Oregon and they want to ship it to Boston? We know the carrier needs 8-10 vehicles to make that run. If there are enough cars waiting to ship in the Portland area, there is no need to travel 200 miles round trip to fetch the Camaro in Eugene. That makes shipping anywhere east difficult, usually slower and more expensive everywhere in Oregon except Portland. Hey, we don’t make the rules … we just play by them. And we’re frank about it. We believe in telling customers like you the obstacles upfront so that you can plan better. Our Oregon Car Transport quote calculator figures it out. 1. If you are in the greater Portland area, our normal timetables will usually apply, regardless of your direction. 2. If you are farther south along I-5 and shipping your vehicle north or south (not southwest), then our normal timetables will also apply. 3. If you are anywhere in Oregon other than Portland and shipping east (or reverse), then you should prepare a backup contact plan and give yourself extra time if possible to ship your vehicle. Remember, Direct Express Auto Transport is the leader when it comes to reliable Oregon Car Transport quotes because our innovative calculator factors in so many variables. You can visit Direct Express Auto Transport to fill out a simple form and get a free car shipping quote. We make it easy to book your vehicle shipment online. Or call us at 800-600-3750 to speak with our very friendly and helpful customer service staff.